Connie and Ken have been longstanding members of the regional arts community, inspirational educators and the consumate artistic team in all of their endeavors. We celebrate their creative relationship and share a comprehensive collection of work. 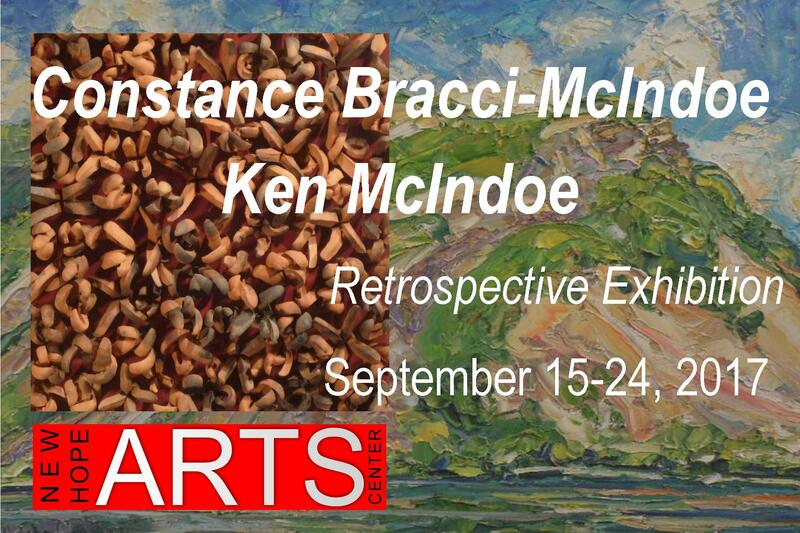 New Hope Arts hosts our celebrated regional artist-couple, Connie and Ken McIndoe, in a retrospective look at their longstanding careers, from September 15 -24. As professional educators and exhibitors their work has a history of distinction in the tri-state area. This exhibition featuring more than 90 works, brings together a full range of paintings and ceramic forms selected by the artists to reflect their creative life together. Constance Bracci-McIndoe was on the faculty the Department of Art and Photography at Queensborough Community College in Bayside, N.Y. for 25 years. She has received awards from New Jersey Designer Craftsmen, The Pennsylvania Guild of Craftsmen, and Mercer County Community College. Ken McIndoe recently retired from the faculty of the Arts Students League in New York where he taught painting for 36 years. He has numerous one person exhibitions to his credit and has received two New Jersey State Art Fellowships. The Hopewell, New Jersey couple have been looking over each another's shoulders for nearly half a century as the consummate artistic team. Connie and Ken are individually curious about the world, and endlessly willing to chase a fleeting idea. Connie's work is elemental; she juggles earth, air, fire, and water to give us a micro view of creation gloriously magnified. Ken works from the macro level. His paintings work towards holding intrinsic ideas onto the canvas. The community is invited to an opening reception with the artists Saturday, September 16 from 5-8 pm. Gallery hours are daily from Noon to 5 pm throughout the exhibition including weekdays through September 24.